Summer is coming to an end and I have surely enjoyed a bit of time off the blog and spent outside with my love, friends & family. I hope you have enjoyed your summer too. I must say that I'm pretty ready for Christmas now - only 113 days left! In the meanwhile I'll be trying to pick up a steady blogging pace here again. Sometimes you really need some distance to think about what you want to do with a hobby you've dearly loved having for the past 4 years, but want to introduce some change to. We'll see where it takes us! Today I want to shine some light on this beautiful Caudalie Vinosource revamp release - I got these in May - that really deserves some attention. I took three of these with me to Florida, and all three are nearly finished now! Caudalie is a French brand that has had its fair share of coverage here on the blog already - and with good reason! Their formulas are gentle - check out more information about their formulation here -, work great for my skin and come in different price categories. 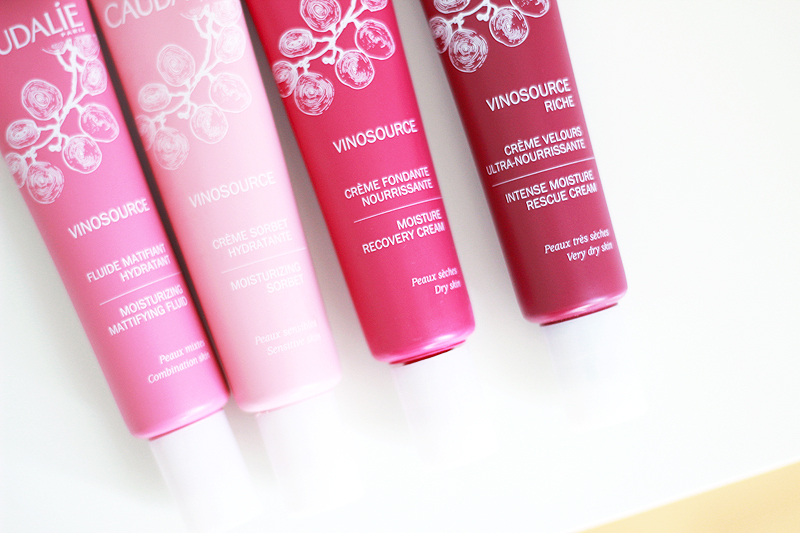 Their Vinosource moisturizers are not exactly new, but what is new is the cute pink packaging. As an avid lover of all things pink (you should see my pink fluffy bathrobe), I welcome this change with open arms. I hadn't tried any of these before, so I gladly took three of these with me to Florida to check them out. And these are my findings..
Vinosource Moisturizing Mattifying Fluid is awesome for combination to oily skin types. The lightweight gel formula has a very light texture that glides onto skin easily and gives an initial burst of hydration, followed by a mattifying effect. On my own combination but dehydrated skin this is a little too mattifying to wear on its own without makeup, but a great match underneath a full face of glam. It'll keep the oils at bay longer and also keeps my foundation stay in place a little longer since the textures get along well. →For hot makeup days that can use some mattifying power. Vinosource Moisturizing Sorbet is my babe. 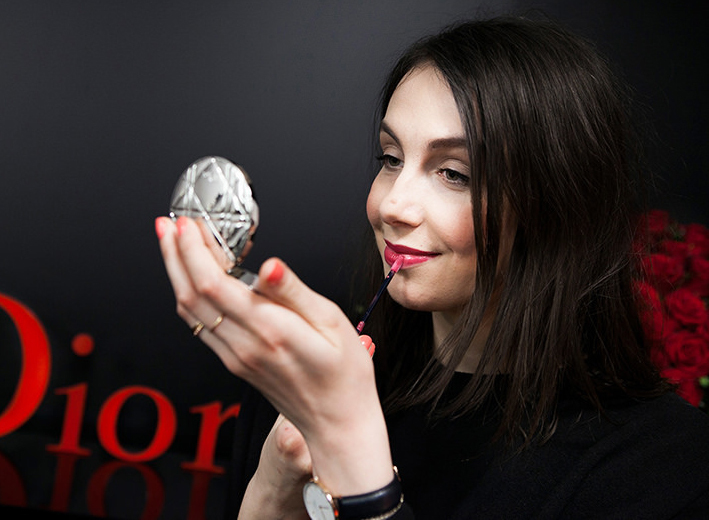 The sorbet texture is very light & feels like a burst of (grape) water quenching your skin when you apply it. This one is great for thirsty sensitive skin types. I have tricky combination skin: it's thirsty and can feel a little parched after showering, while I will also get oily in the afternoon, after which I do need to blot. These types of lightweight textures are perfect for my type of skin as it'll moisturise generously but isn't too rich. I wear this comfortably both underneath makeup as without makeup. →For daily gentle grape power. Vinosource Moisture Recovery Cream is a creamy tube of intense hydration. I took the name quite seriously and used it as a recovery cream in Florida after our fun filled days spent in the hot Florida sun. It soothed my skin perfectly - I added a generous layer and kept it on overnight, leaving the grape seed oil to work its magic. 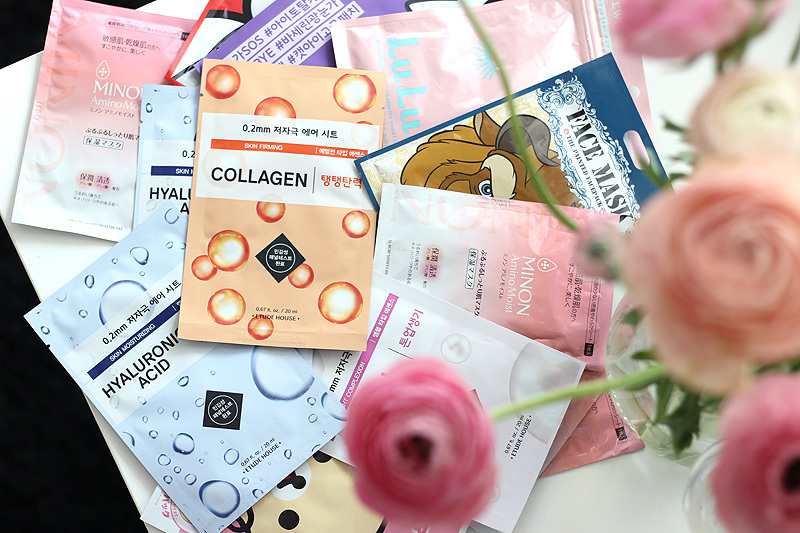 →For dehydrated skin that can use a good pick-me-up. Vinosource Intense Moisture Rescue Cream is the only one I haven't tried yet - I am secretly (or not so secretly) keeping it for when the coldest months of winter hit. I always go through this phase where my skin seems perfectly fine with the transition into cold weather, and then all of the sudden goes all bananas. This intense moisturising cream if formulated with shea butter, an ingredient I don't like to mess with during any other season but winter, but love dearly whenever that crazy winter transition craziness hits. → For very dry skin types, or whenever winter craziness hits.